This Saturniidae is very common the eastern U.S. and southern Canada. Wings span are up to 9-10 cm. its larva is very hairy with spines that can sting very painfull. foodplants are many different bushes and trees such as willow,apple,rose,oak ect. Shot was made in Argentina,in which I recieved some larvae that puptae and emerged. Beautiful shot with very vibrant colours and really sharp detail. Excellent pov. beautfil moth with great detail in the wings, just wish you had said where and how you 'shot' it. I Love this butterfly Oz. Great composition, POV and BG. Excelent detail...you can almost feel the small "hair" on its wings. I love the colors. Wow! Superb macro. The detail is wonderful! I really like the composition and the way the black background makes the colours and shapes stand out. Well done! Hello OZ, very nice macro-shot with this marvelous buterfly! !Razorshape details and colors that blend well on the black BG. Very well done, Didier. En voil� un qui s'accroche! La tige horizontale est une id�e originale. Great details on this impressive moth. very colourful, sharp and detailed picture of this Saturniidae. Artwork of nature and the photographer. Where did you find the species? This is a great shot with excelent colours, compo nad sharpness. A great butterfly!!! The photo is very good: color, details, texture, dark BG, composition and POV are simply perfect! Wow!!! Oz, that's realy phantastic. What an incredible butterfly, Oz. I have never seen anything like that before. The yellow underwings with the blue "eyes" and circles are just amazing. Great POV and the subject is well shown against the black BG. Perfect DOF, details, POV and sharpness! Shots such as this one set very high standards on this site. It is one of the finest macro captures I have ever seen on the TN. Superb POV, DOF, focus, sharpness, colours and details. BTW, if the image was shot in Argentina, wouldn't it be better to locate it there in your image info? sorry for nit-picking! very appealing iconic presentation of this moth with its stunning markings of eye mimicry! I can not imagine this beauty with 10 Cm of wings span. The patterns are amazing, I love it. You seem to have taken the shot for a book, it is very descriptive and sharp & details all over. The insect is very well seen. Thanks for sharing and for the info. Such a colourful moth! Look at it's colours and patterns on the wings! Great use of flash! Sharpness, texture , details, pov, bg all are just great! Congrats again! Another superb macro ! 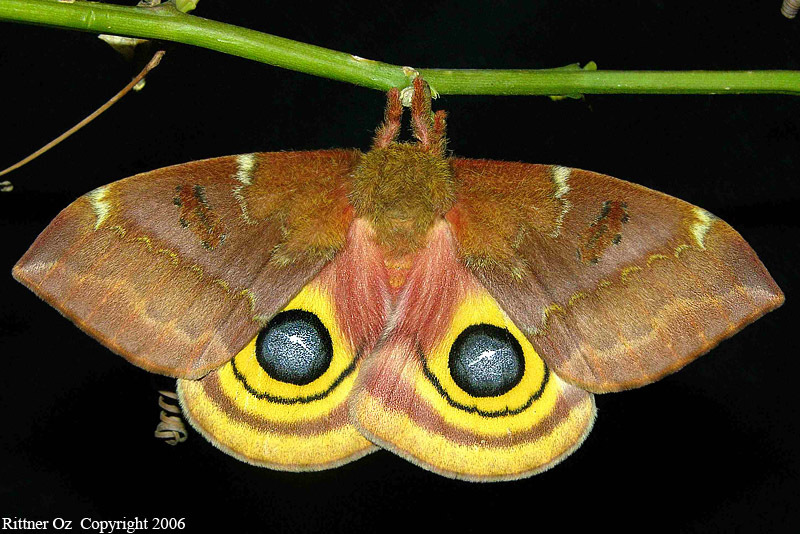 This Automeris io is impressive with its big "eyes". Colors, contrast and sharpness are excellent. Congratulations Oz. Otra gran captura, fundamentalmente por la limpieza, nitidez y colorido de la imagen. Muy buen explotaci�n del flash. Another great capture, fundamentally for the cleaning, colorful and clearness of the image. Very good exploitation of the flash. really an amazing picture taht you have captured in all its beauty. The intense colours and the details are the best in this photo; the black BG works perfectly in this cxase. Just great!! No more words to say.. Are these moths living in the wild in Israel? or from some collectors? Mario sends greetings from Canada. Excellent shot!The sharpness is perfecte with great details and colors welle satured.